It's important to create a backup image of your PC before upgrading to Windows 10 from Windows 7 or Windows 8 so that you can downgrade Windows 10 if there are errors during the upgrading process. Why Backup PC before Upgrading to Windows 10? Many users want to upgrade to Windows 10 because it has great improvements and it is free to upgrade in a year. However, system upgrade is a big challenge, and it is risky because upgrading may fail and result in system crash. It may make old programs not work as normal even if the upgrading is successful. Therefore, to prepare your PC for Windows 10, it is unwise that do not to create a backup image of your PC, for any reasons, you want to downgrade to the familiar Windows 7 or Windows 8. There are lots of methods to utilize the Windows built-in tools to create restore points and backups allowing you to restore your computer to a previous state in case problems occur. As described above, upgrading to Windows 10 is a big step, so you may not want to rely on the Windows built-in backup and restore features but a third party backup freeware - AOMEI Backupper Standard, which is capable of a complete disk restore even if the computer is unbootable. If you don’t want backup your full system, as least create a file backup in Windows 7 in case of personal files being overwritten. The PC you want to backup. A hard drive to hold the backup image. An external hard drive is highly recommended in the event of hard drive failure. A copy of AOMEI Backupper Standard. A USB disk or CD/DVD-R/RW disc to create bootable media. Note that all the data on the USB disk or CD/DVD-R/RW disc will be deleted when creating bootable rescue media. AOMEI Backupper basically can do many types of backups: System Backup, which will automatically choose the partition(s) containing operating system (OS) and boot files including all the programs and files on C: drive to backup; Disk Backup, which can backup your hard disk drives or other storage devices to an image file; Partition Backup, which can backup partition(s) or dynamic volume(s); File Backup, which can backup individual files or folders into an image file. You can select Disk Backup or System Backup to downgrade to Windows 7 or Windows 8 from Windows 10. AOMEI Backupper Standard, free windows backup software, is one of the best way to create a backup image of your PC before upgrading to Windows 10, for it allows you to backup your system hard drive using "Intelligent Sector Backup" or "Sector by Sector Backup", it supports creating two kinds of bootable medias, and it even enables you to restore disk backup between MBR and GPT disk. With its concise interface and humanized design, you can use it to backup computer before upgrading with a few clicks . 1. Install this freeware and launch it. Then click Disk Backup under the Backup tab. You can also select System Backup, which will automatically choose the partition(s) containing operating system(OS) and boot files to backup. In this way, all the programs and files on C: drive will be backed up along with the OS. 2. Click Step 1 to select the source disk you want to backup. If you like, you can write a task name in the box so that you can distinguish it from other backup tasks. 3. Click Step 2 to select a destination location to backup to. 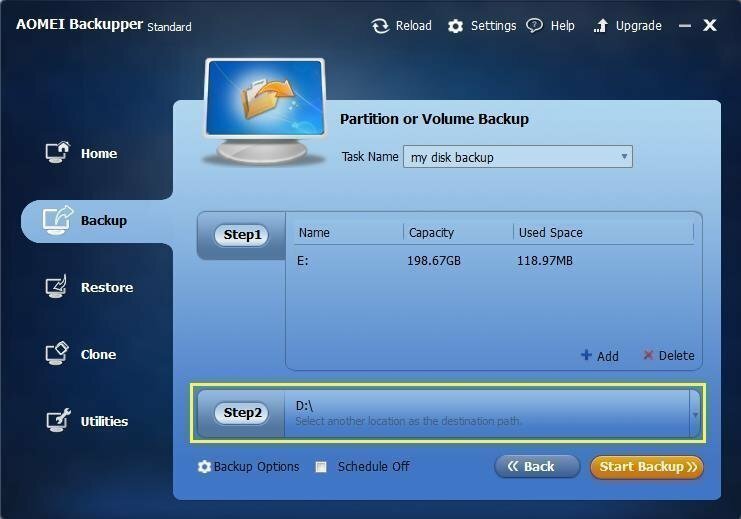 Backupper can backup to any folder or partition as long as it can be recognized in Windows. 4. Click "Start Backup" to perform your system backup. Powered by Volume Shadow copy Service (VSS), Backupper allows you to use the computer while the backup is running. A few minutes later, click Finish to exit. Besides the great feature to create a backup image of your PC before upgrading to windows 10, AOMEI Backupper can clone your hard disk or system in case you want to go backup to the prior version of Windows, AOMEI Backupper can boot your computer with the bootable media or AOMEI PXE tool to restore your PC if your computer is unbootable caused by upgrading failure, and AOMEI Backupper can even restore your PC to another computer with Universal Restore checked.